needs an autumnal dress-up. What's yours wearing? Make it easy to do by following my rules. I am going to call them rules, even though we hear so much about follow your heart and break the rules when it comes to decorating. Unlike home decorating, home staging goes by a set of rules. Some people struggle with arranging vignettes like seasonal mantel displays and table vignettes. If that's you, this post's for you. Just like the Christmas mantel I blogged about last year, having one large item gets you off to a great start. My favorite big starter is a piece of art, or even an empty frame or two. Center the big thing or else place it off-center. Once you get more accessories on the mantel, you'll probably be re-arranging it to experiment and fine tune. Other initial decor pieces that work well when staging a mantel are a good-sized mirror, a large platter, or a jumbo wreath. I've also used a sculpture, wall hangings, ships models, and floral arrangements. Use what you have. Wreaths are home stagers' and decorators' go-to prop. They come in all sizes, styles and shapes. 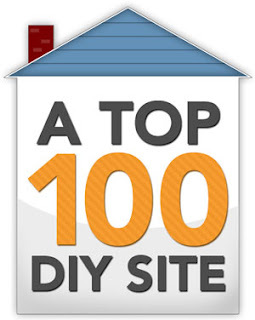 They are easy to DIY and can always be counted on to designate the season. When a home is on the market, a little seasonal decor goes a long way to let buyers know the home is loved and well-managed. Just make sure your Christmas wreath isn't still hanging around in April. The wreath might be your one large item, like the one I used to stage another autumn mantel. The chimney breast is a natural for the wreath, but anywhere on or even under the mantel works as well. 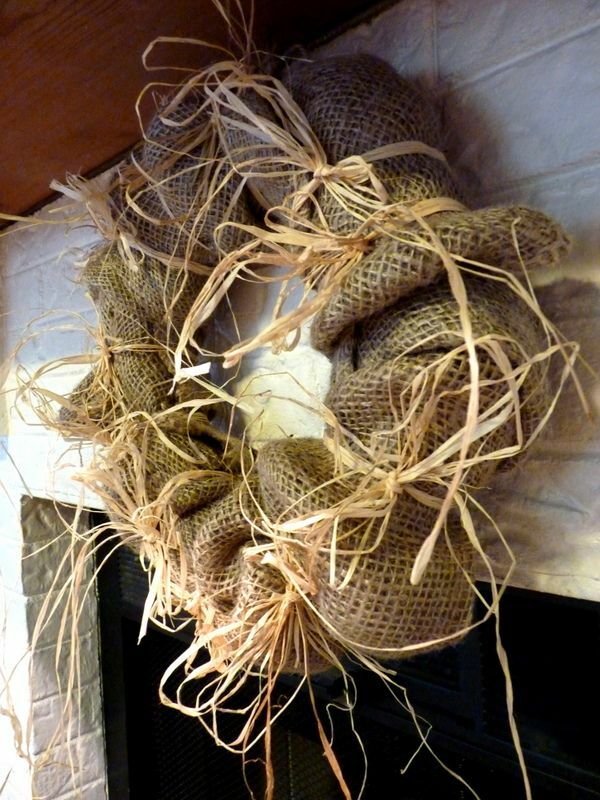 The burlap and rafia wreath I made would need to be removed if there were a fire in the fireplace. Tractor Supply Company? And the best part was the price -- one dollar each! I just wrapped them around a foam wreath and tied it all with rafia. Although they aren't essential to mantel staging, what could be more accessible and economical than books? 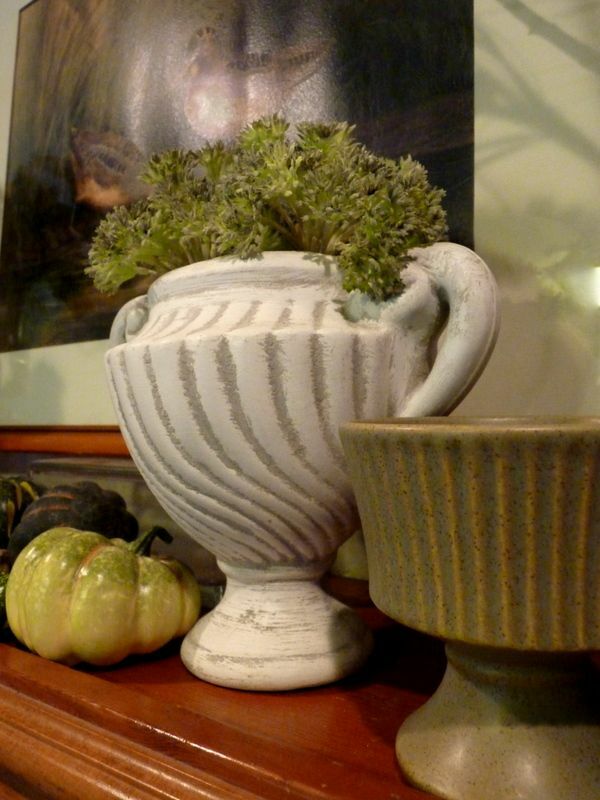 Find a stack that fits on the mantel and lay them vertical or horizontal. I like older books for the character they add to a grouping. 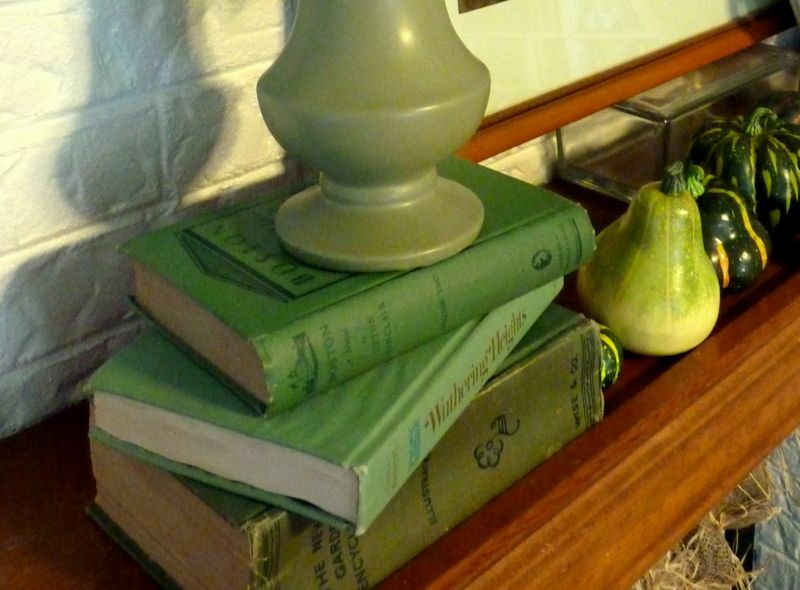 When you're staging your home, you can use books in your favor, as supporting members of your cast of props. Books telegraph a message to people viewing your home. Think about what you want the message to be. Vintage children's books are safe, and so are botanical, travel and wildlife books. How about books that emphasize what's unique about your locale? Of course, people shopping for a home won't read your books, but many people read spines, out of habit or curiosity. Peak their interest. But avoid anything racy, political, religious or controversial. People like to do business with people who think and look like them, only better. Because, you know, they are buying your lifestyle when they buy your home. can stay put past Halloween. A little stack of green books to the rescue! Notice how I've propped up the framed art on a glass box to give it height. Every room should include some organic elements -- a plant, flowers, fruit, or even shells, logs, leaves, twigs and other outdoor gleanings. There's a decor store featuring free accessories somewhere in your town -- a park, a beach, the woods, or your own yard. When I recommend fruit, flowers and plants, the artificial ones pass for home staging's purposes, as long as the quality is there. 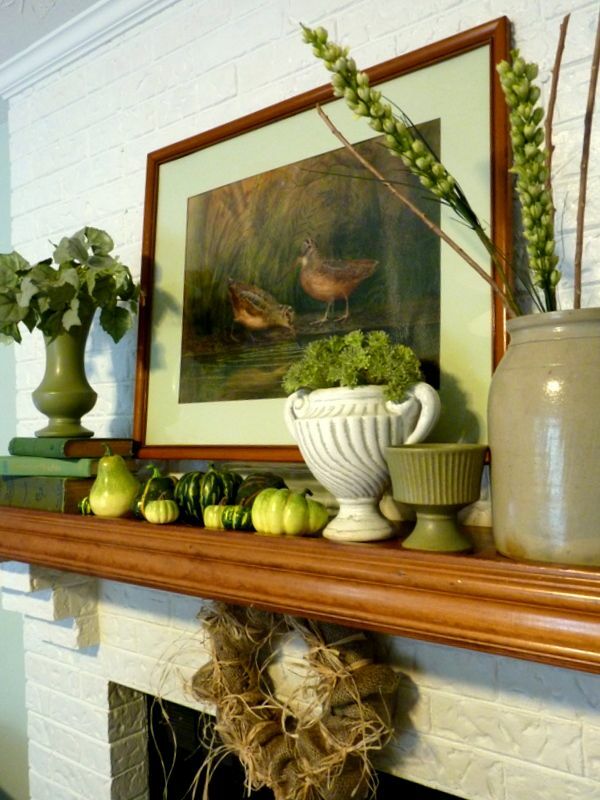 I used some greenery and gourds to give the mantel a fall-ish feeling. I also chose the artwork over the mantel to reflect the season. I inherited this vintage watercolor of woodland fowl, and made a new mat for it because the frame and print were in good shape, but the mat was stained. Not only does it bring a touch of nature into the room, but its antique quality has some personality. One of the principles of good design is that certain elements get repeated, but there has to be some variation. Otherwise, your props are just a line of marching soldiers. So look for a variety of textures, but keep the colors similar. Or repeat a shape, but change the size. Don't forget to stagger the items to create a rhythm as you read from left to right. repeat the motif of vertical ridges. They share a pattern, but they aren't identical. 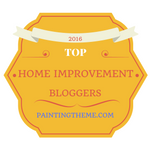 Be sure to read the other mantel staging posts I've written and linked to above. A fireplace in a home on the market is an asset that needs to be emphasized. Furniture arrangement and mantel staging are the best ways to do that. For more DIY home staging advice and encouragement, download my $4.99 eBook, DIY Home Staging Tips to Sell Your Home Fast and For Top Dollar. What Makes a Great Tablescape?